South Park releases its first game in quite some time. There's a lot of hype surrounding this one, but does it live up to any of it? Seventeen years ago, I remember hearing word of a new cartoon being spread around the playground. It was called South Park, and, although I did not know much about it, I knew one thing: it was a bad show and my parents would NEVER let me watch it. Flash forward to my college years, and I find myself finally watching South Park, being able to fully appreciate the humor and satire in a way an elementary school kid never could. Over the past seven or eight years, I've found myself an avid fan of this series, so the news of a new video game most definitely caught my interest. Add in that the game would be written and voiced by creators Trey Parker and Matt Stone and it was pretty much a guarantee that I would be playing the game from day one (and I did!). This one is coming in with quite a bit of hype, so it was time to find out if a video game could live up to the high bar set by the series. 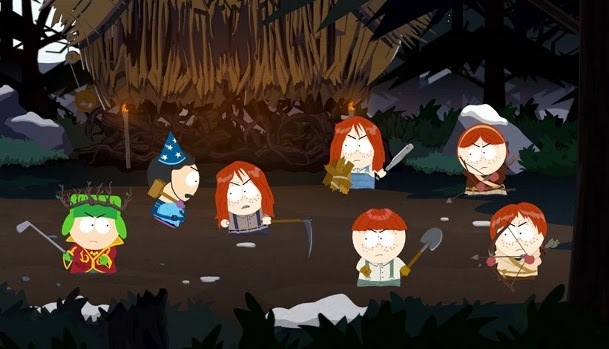 Stemming from a number of episodes featuring the boys at play, Stick of Truth sees the four boys and their friends playing a LARP version of capture the flag. The flag? A "mystical" artifact called the Stick of Truth, which gives the bearer the power to control the universe. In true South Park fashion, what starts out as a simple game is slowly expanded into something much more. As mentioned, the story for this game is written by Parker and Stone, so it does not disappoint from a writing standpoint one bit. This game is packed to the brim with cameos, unique items, and all sorts of other references to previous episodes, going all the way back to the series beginnings. As the game is an RPG, the story unfolds through a series of quests, with some involving simply giving an item to someone else, while others involve multiple locales, characters, and battles. In one quest, I found myself going from a secret hideout to an abortion clinic to Canada...all to recruit some people to my team. All of this is done in the classic South Park style: commentary is made on various aspects of culture and pop culture, and the boys (mostly) ignorantly get themselves into a lot of trouble. With Parker and Stone providing all of the voices too, it helps to add an extra layer of authenticity to the game. 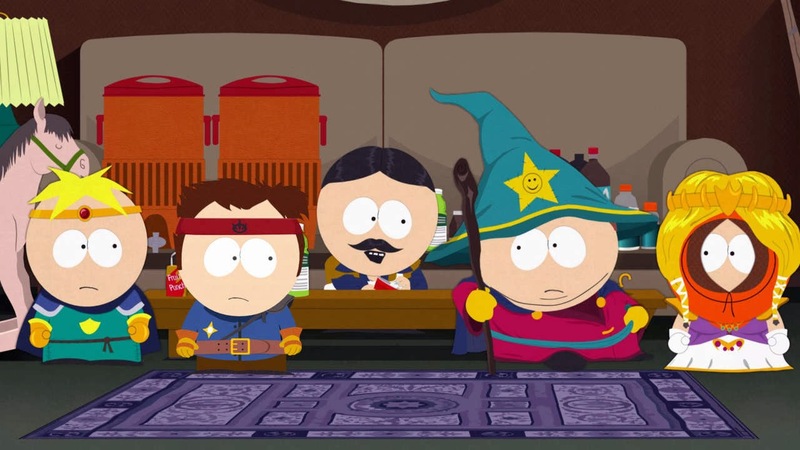 You play as a new kid to South Park, which is where the more traditional RPG elements come in. Every bit of the character is customizable, as is to be expected, and even your parents skin tone changes based on which one you selected (a nice touch). Also in typical RPG fashion, your character does not speak at all, something the characters comment on quite a bit. Although the lack of dialogue does mean your character is developed through the exposition from your parents and others, it all seems to tie into the game's larger satirical commentary on video games as a whole. In addition to the story, there are also a multitude of side quests which help add to the replay value of the game as a whole. Many have reviewed this game as simply a 14-16 hour episode of South Park. While that is a legitimate view in some ways, this is a view which is a bit off. 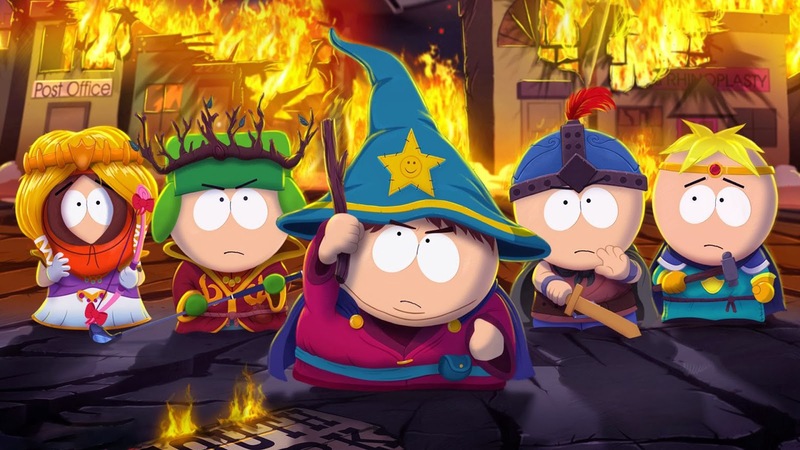 It is far better to consider this more of an immersive South Park experience, taking place in a world that feels fully formed by its creators, rather than just simply playing through the series. The nonlinear nature of the RPG story lends itself more to this line of thinking. Before going too much further, perhaps it should be mentioned that this reviewer is not a huge fan of RPGs. In fact, actively avoiding RPGs has been a specialty of much of my life as a gamer. Leave it to South Park to change that. Despite its simple appearance, Stick of Truth has a multitude of options in terms of weapons, equipment, and general character customizations. As the game itself mentions, it is in your best interest to continuously update your character's weapons and appearance as such upgrades will be a significant help as the game goes on. The game offers four basic classes: Fighter, Mage, Thief, and Jew. Playing as the Mage class made most of the fights a relative breeze, especially when using one of the Buddy Characters as well (options include Butters, Princess Kenny, Stan, and others...Butters tends to be the best). Most fans of RPGs will be used to such varied options, but it is a lot of fun to try different combinations of clothing and weapons to give your character the best advantage in a fight. One aspect that some RPG fans may not like as much is that leveling up does not happen as quickly as in other games. By the end of the main story, most players will find themselves around the level 15 mark. Combat is turn-based. As Cartman puts it, it is the rules all the boys of South Park have agreed to in this game, but it also applies to the varied other kinds of enemies you encounter as the story progresses. If you are like me and are not too familiar with RPGs, think of this like Pokemon. In your turn of combat you may first use an item of some sort to boost health, power, or mana; then, you may choose to either attack with a ranged or melee weapon, use a special power, or use magic (farts). The only complaint which can be really lodged against the combat is that the wheel to choose your attacks is just a tad too sensitive, making choosing an attack during a stressful situation a bit difficult. Some enemies are weak to certain types of attacks, and the enemies are varied enough that the game does not allow you to become too comfortable with one style of attack. Pretty much once a new section of the game was reached, I felt I had to change up my play style, Buddy Character, and attack order. This is a nice touch that really helps you to not get caught in the rut of following the same actions each turn. 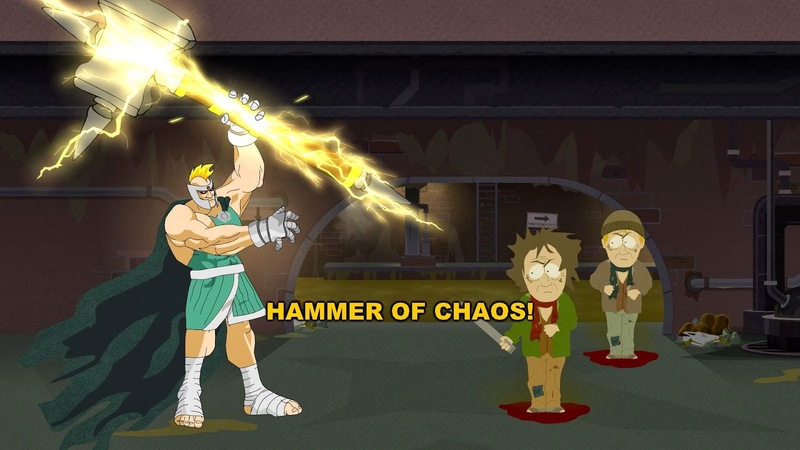 Side-scrolling would perhaps be the best way to describe the gameplay of Stick of Truth. For the first time ever, the city of South Park has finally been mapped out. After seventeen years, you can finally know how close the boys live to one another and where locations such as South Park Elementary, South Park Mall, and City Wok can be found. As the map was done by Parker and Stone, it is fair to say that this can be treated as canon. South Park has always been described as a small town, but it never truly felt so little until this game mapped out so many of its major locations. Looking at the still above, it may be hard to believe that it is actually how the game looks and not just an episode of the show. The general look of the game is something which has been harped on quite a bit in the hype leading up to its release, but the videos have really not done it justice. Just walking around South Park, it felt so accurate to the show's animation style that I often found myself forgetting that I was actually controlling much of the action, losing myself in the entire South Park experience. In today's world of gaming, graphics have become a huge part of enjoyment, with bad graphics being something which can make an amazing game a poor experience for some players. 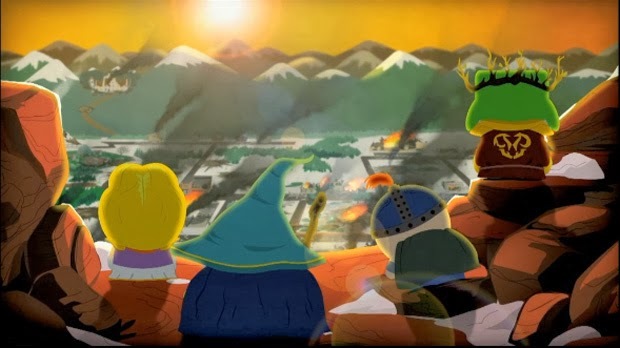 Such graphics snobs should (and most likely would) put aside such pretension with Stick of Truth. The look of the game may be the biggest selling point. If you love South Park and have always had a secret yearning to be a part of the cartoon, you can now finally live that experience. Playing the entire thing in HD also helps quite a bit. The only negative to the way this game looks is that occasional frame rate issues really take one out of such a specific experience. Although it should be noted that I only noticed frame rate issues when I had my character running from one place to another instead of walking. Frankly, South Park the Stick of Truth is one of the most disgusting games I have ever played, but it is also one of the funniest. Considering the source material, neither of these factors should be a total surprise. The writing takes a step back from the gripping satire of the series, but it definitely has its fun with video game culture (the Canada section in particular is hysterical and not worth spoiling). While this game may not make me an RPG fan, I definitely came away with an appreciation for why the genre is so beloved. I may have beaten this game in only two days, but I am more than confident that I will be returning to South Park very soon for another adventure. There are a few small complaints to be had here and there with the mechanics, but this is very much so the ultimate South Park experience. If you are a fan of this series, this is a definite must buy. While few others would be convinced to take part in this game, it should be a more than satisfying experience for those who want to come on down to South Park and have themselves a time. Are you a fan of South Park? Have you played the game? Leave your thoughts in the comments below!